Comics Commentary: Spain Rodriguez's "Manning"
Very sad news regarding Spain Rodriguez's passing. I discovered his work through reference books about comics (most probably Toutain's Historia de los Comics), at an age in which I wasn't supposed to read underground comics. Nevertheless, being a big fan of Harvey Kurtzman's MAD, it wasn't a big surprise that I ended up being an enthusiastic reader of underground comics as well, most definitely including Spain Rodriguez's work. I was able to track down Spain's work thanks to Fantagraphics' reprint volumes (part of their quixotic attempt to reprint the work of several underground comix artists during a period in which there wasn't a bookstore market for comics like these): 1989's Trashman Lives! and 1994's My True Story, a book that collected his autobiographical and non-fiction stories, a body of work that probably showed Spain at his best. The following is just a minor footnote in his career, but it is a somewhat unexpected example of Spain's influence and may be of interest for those who (like me) enjoy comics trivia. With the prospect of a better and fairer future ahead of us, John [Wagner] and I enthusiastically talked about his idea for a cop of the future. We were both impressed by a one page American underground strip called Mannix that was reprinted in Comix: A History of Comic Books in America, by Les Daniels. It featured a ruthless cop who shoots a fleeing criminal in the back and was obviously satirising dirty cops some years before the Clint Eastwood films appeared. We were also impressed by a story in American magazine Weird and Eerie where a science fiction cop pursues a criminal through a futuristic city and executes him. We then discover the perp’s crime – he was carrying a copy of a sick and seditious magazine, Weird and Eerie! Thanks to Tom Spurgeon, we already knew that before "Before Watchmen" there was Spain Rodriguez. 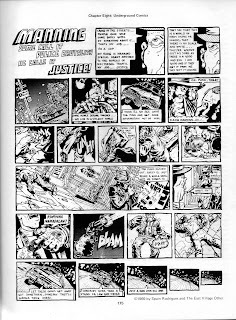 It turns out that before 2000 AD and Judge Dredd there also was Spain Rodriguez. Yo Rod, Thanks for posting the link to this blog post re Spain. 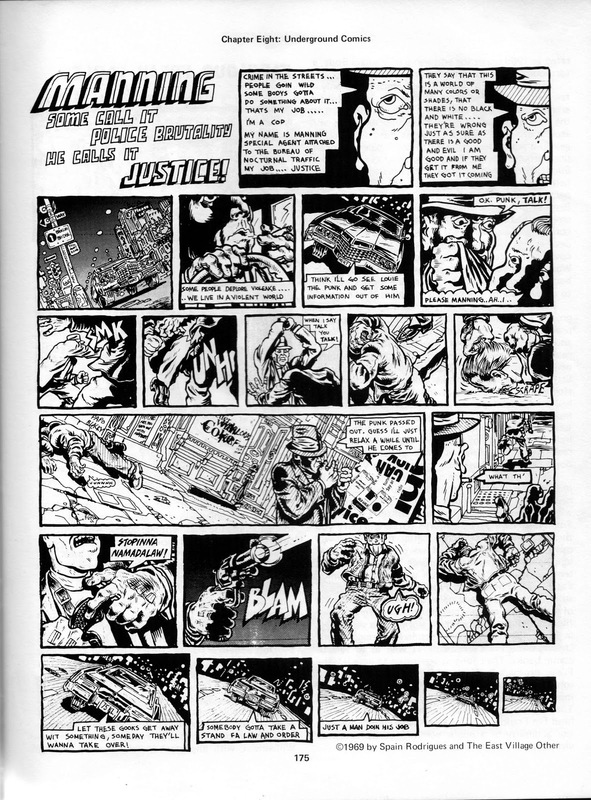 I never knew the watchmen and/or Judge Dredd influence connections before I read it form you first. Am always appreciative when i learn some thing "new" in the world of comics.